History of the Bell Building | SAVE the BELL! The building at 25-27 Auburn Avenue was built as a telephone exchange by the Southern Bell company in two stages, in 1907 and 1922. 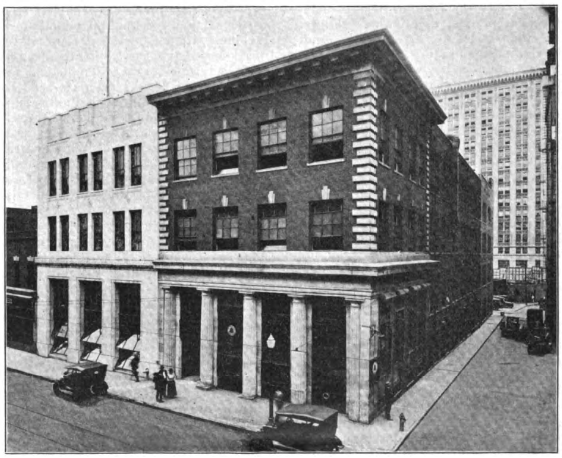 This was a period of rapid change and expansion for the telephone industry; the 1907 portion of the building was engineered to support up to 4 additional stories as needed. The 1922 portion (left side) was designed by famed Atlanta architect P. Thornton Marye (Terminal Station) and brought revolutionary “machine-switching” technology to Atlanta for the first time, introducing locals to the now-ubiquitous dial tone. The 1907 portion is steel-framed, while the 1922 is reinforced concrete. Interestingly, concrete piling was constructed to anchor the new portion into bedrock, and the older portion was then attached via cantilevered beams. The two portions are now inextricably entwined. 25-27 Auburn Avenue is representative of of a conscious effort by Southern Bell in the early part of the 20th century to construct buildings that fit in with their surrounding neighborhoods. It now stands as the oldest building for blocks and the oldest surviving telephone-related building in Atlanta. Because the building was designed to hold large banks of long-removed machinery, it has an open floorplan that could easily be adapted for a new use.